COMPLETELY REDONE! 2 Bedroom + Office / 2.5 Baths, 1,325 sq. ft. of living space. 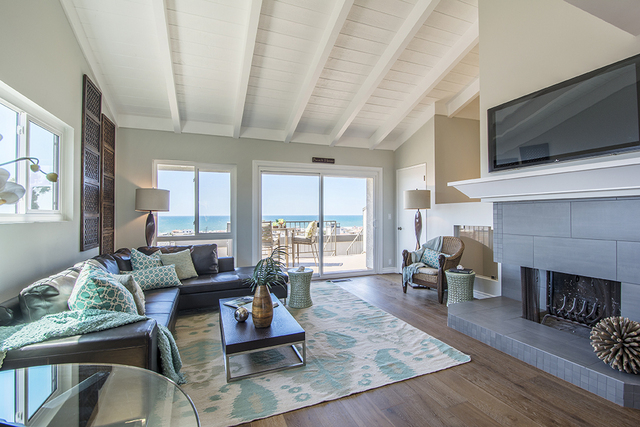 Beautifully light, bright interior with stunning panoramic ocean views through new windows. New custom wide plank hardwood floors and carpet, new designer paint colors. Lovely molding throughout and gorgeous tile work in the new bathrooms. Open beam ceilings and elegant fireplace in the family room. Gorgeous Chef's Kitchen with stainless Viking appliances including a wine refrigerator, Carrera marble subway tile backsplash, Caeser-Stone Counter tops and French door refrigerator. Indoor laundry room, 2-car garage. Redone top to bottom, and an absolute MUST SEE!! !